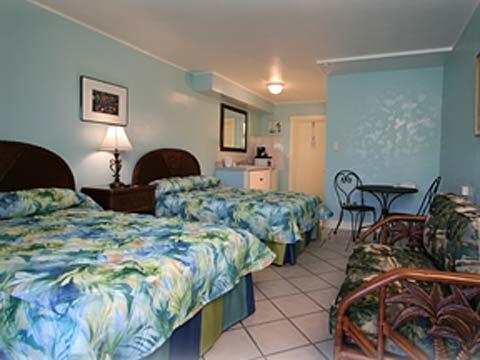 Experience the "Old Keys" in a lush, tropical setting at our family friendly motel. Our newly remodeled rooms have refrigerators, microwaves, and coffeemakers. Located a MM50, the Sea Dell is in the center of Marathon and the "Heart of the Florida Keys." We have a beautiful fresh water, heated pool, and we are only 1-1/2 miles from Sombrero Beach, one of the most beautiful beaches found in the Keys. We have picnic and barbecue areas for your enjoyment and a washer and dryer on premises for your use. All our rooms are non-smoking. And, we have free hi-speed internet! The Sea Dell Motel is located in an ideal area very close to many attractions, restaurants, shopping, scuba diving, snorkeling, fishing charters, and more. We are just down the road from the Dolphin Research Center where you can swim with the dolphins and Crane Point Hammock, a 64 acre protected area of historic sites, nature trails and museums. Fine restaurants, stores, fast food, grocery stores, and live theater and movies are all within walking distance. Sombrero Reef, one of the most beautiful sections of North America's only living coral reef is only several miles offshore. The opportunities for adventure in the Florida Keys, and the availability of some of the best fishing, diving, snorkeling and watersports in the world, await you! Fishing and Diving We are located between Tilden's Dive Center - www.tildensscubacenter.com - and the World Class Anger - www.worldclassangler.com - who can help you plan a fantastic day on, or under, the water. Dolphin Research Center Just 8 miles north of the Sea Dell, this working research center has tours and lots of educational fun for children and adults. You can book a session for a dolphin swim. Crane Point Museum This large park is just a few blocks from the motel, find a museum of local Keys history and an educational Nature Walk. The Wild Bird Center is also located here - the center rescues and rehabilitates injured birds found in the Keys. Pigeon Key Stop at the train car gift shop on the ocean side just before the 7 Mile Bridge to purchase a ticket. Enjoy a ferry ride to historic Pigeon Key. Lovingly preserved from the early days as a work camp for the Flagler Railroad, the Key has a guided tour and a Flagler Museum. Bring a picnic, or snorkel from the dock. Sombrero Beach Located just 1.5 miles from our motel, Sombrero is the jewel in the Marathon Community Park system. Just finished with construction in late 2003, the park has an excellent beach and swimming area and full facilities, with new shower buildings, picnic shelters and more. Pet-friendly, too. Bahia Honda State Park One of the top parks in Florida - well known for the great beaches and scenic vistas. Also has snorkeling and diving charters-several beaches and play areas, snack bar. Located at MM37, only 13 miles from the Sea Dell. Restaurants Many great specialty seafood and other ethnic restaurants can be found in Marathon, some within walking distance of the motel. Stop by the front desk for tips, or check out our local restaurant guide. The Marathon Chamber of Commerce website offers an up-to-date listing of activities, restaurants, diving and snorkeling services, fishing, shopping, watersports and a calendar of local events.